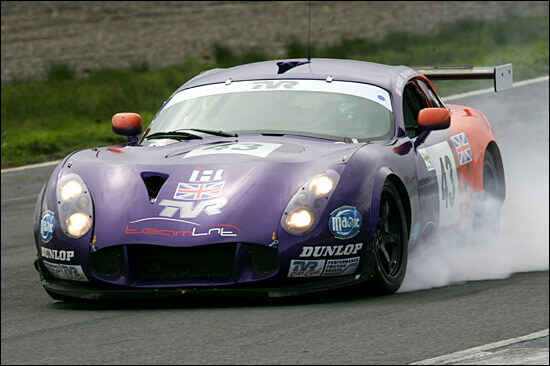 It’s now six race weekends in five different countries, in a packed racing programme for team LNT and the TVR T400Rs. 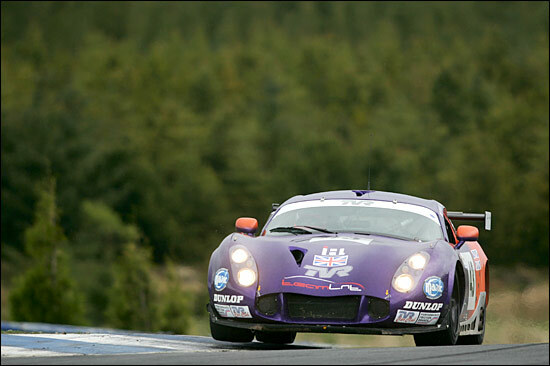 After the world famous circuits at Sebring (USA), Spa-Francorchamps (Belgium), Magny-Cours (France), Silverstone and Donington Park, the May 21-22 weekend’s action would take the team north of the border, to Scotland’s tricky Knockhill circuit. 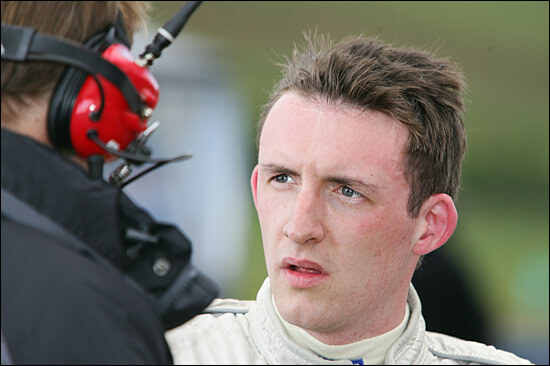 Andrew Thompson would become the eighth driver to campaign an LNT TVR this season, the Scot standing in for team boss Lawrence Tomlinson who was, quite properly, on 10th wedding anniversary duty for the weekend. It would prove to be a busy Saturday for the backroom boys at LNT, after both cars disgraced themselves in the morning, untimed practice session - the #43 car suffering a broken rocker which would require an engine change, with #42 ending the session with an entirely unrelated mechanical problem. The problem for the team was that the furiously-paced racing programme meant that they only had one spare straight 6. The #43 car was already undergoing the engine change and this car would be the grateful recipient of the spare. #42 would be reliant on the skills of LNT’s crew to build a race ready straight 6 from the two broken units. It was achievable, but not in time for the car to race on Saturday. Indeed even the #43 car’s engine change would leave the team struggling for time, Pat Pearce joining the first qualifying session with just 10 minutes remaining. But that’s where the bad news finished. Pearce got a couple of evenly paced laps under his belt to check the new installation and then got straight into his stride. His second flying lap was good enough for provisional pole, Patrick feeling as if there was more to come. The short Knockhill circuit, plus 20 or so GT cars, makes for a busy track, and getting a clear lap requires a combination of good tactics and good luck - and Pearce had had all he was going to get of the latter for this session. As the grid formed up the track was still drying after a downpour just an hour before. 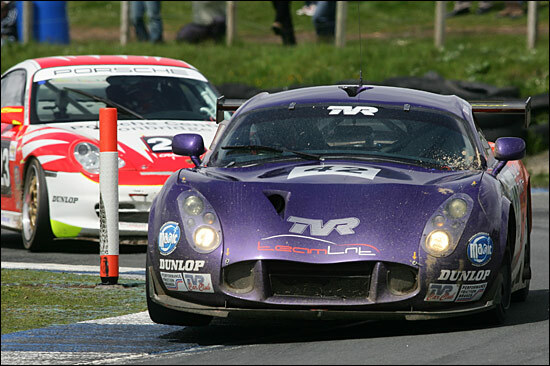 It was time for a judgement call and both Scuderia Ecosse Ferraris, the LNT TVR and both team Eurotech Porsches were fitted with intermediates. That left just the Embassy Racing Porsche and the RJN Motorsport Nissan to break the trend and both went with slicks: at the start of the race, with rain in the air, it looked a risky choice. After lap 1, it looked just plain wrong, as the other leading GT2 runners powered away, Patrick Pearce well in touch with the lead battle, Mike Jordan and Nathan Kinch locking horns, the TVR right in there in third, in the middle of a closely packed train of five cars. Pearce was flying and muscled past the second placed Ferrari at Clark Curve. 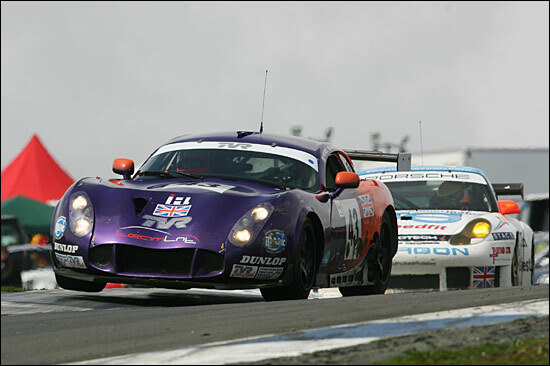 There was trouble ahead though, the TVR adjudged to have received outside assistance on the grid outside the allocated time. “One of the lads slapped some tank tape on, nothing more,” and handed a five second stop-go penalty. Perhaps in reaction, Pearce slid wide at Scotsman’s Curve and dropped back to sixth behind Cunningham, before taking his penalty a lap later. The other major change was that the choice of slicks was now paying off as the track started to dry out. 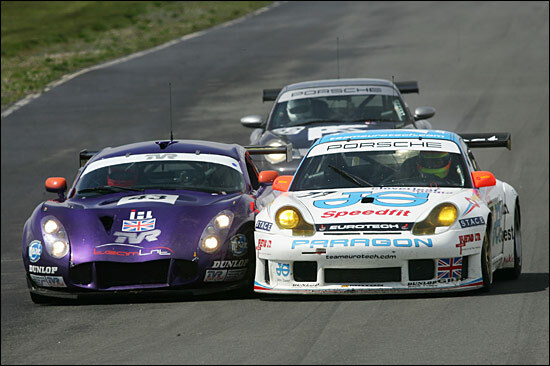 In no time at all the Embassy Porsche led the race and, incredibly, it wasn’t long before the Nissan was up to second: the intermediates on the other GT2s were struggling badly. Pearce hadn’t given up, he was now pushing hard to make up the lost ground and, with the pit stop window looming, he was reeling in the quick Eurotech Porsches of Godfrey Jones and Mike Jordan sixth and seventh overall. Jordan, Niarchos’s Ferrari and Pearce were the first to pit: all three cars would be fitted with slicks of course but the manner of the Scuderia Ecosse stop (and that of the sister car two laps later) would have repercussions later in the race. Warren Hughes powered out to take up the chase in #43. Kirkaldy was by now aboard the leading Ferrari, pulling clear of Mullen and reeling in Cunningham ahead, with the Nissan now fading fast. Just as it looked impossible for Collins to fend off the charging Ferrari, the timing screens flashed up a reminder of the pit stops just 20 minutes earlier: both Ferraris had changed tyres during their 45 second stops but they had done so whilst the driver change was still underway, and both 360s were ordered to take a drive through penalty. There were stunned expressions at team LNT, the penalty seeming at odds with their own stop/go for an infringement where no advantage had been gained earlier in the race. Collins then was now almost assured of an unchallenged run to the flag. 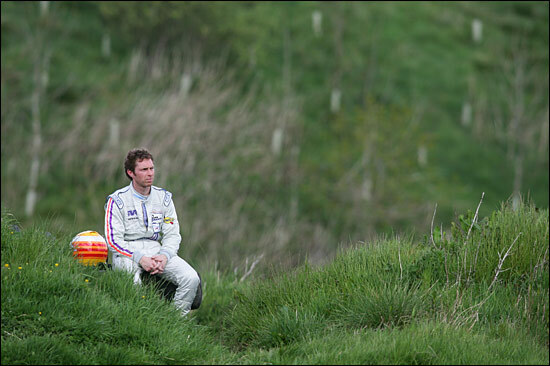 Behind him there was still much to be decided and unfortunately some of it would be at the expense of Team LNT, Hughes pitting to have the intakes cleared after a grassy moment. 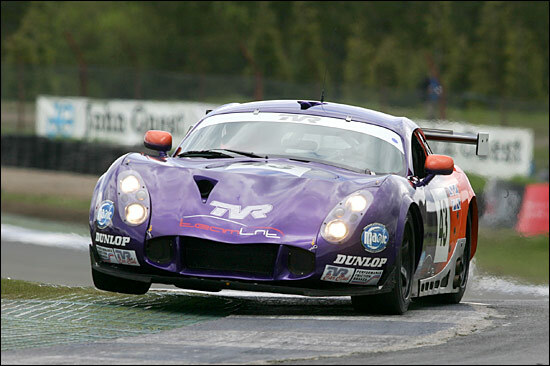 It would cost the TVR two places. With Embassy claiming a debut win in the championship, LNT was left with just a sixth place finish They’re getting used to better than that. Jonny Kane took up his position at the back of the grid in the #42 TVR, the car sporting a straight six constructed from the remains of the pair of engines which let the team down yesterday - a broken finger follower the diagnosis for #42, the team concerned that the root of the problem was a faulty component, and keeping their fingers crossed that it wasn’t a batch fault. As the pace car pulled off to release the field, Andrew Kirkaldy was straining at the leash, with Tim Mullen and Warren Hughes (in #43) snapping at his heels. Behind this trio there was a huge gap as the lights went green - Ben Collins had wrong footed himself and the remainder of the field with a muffed start procedure, and by the time the Embassy Racing man had realised his error the leading trio were the length of the pit lane ahead of the chasing pack. Ally McEver in the Nissan was another runner with a slow start, the Nissan dropping back on the first lap and then sliding wide at Scotsman’s Curve to emerge 15th overall, just ahead of a charging Jonny Kane, the TVR already having made up several places. 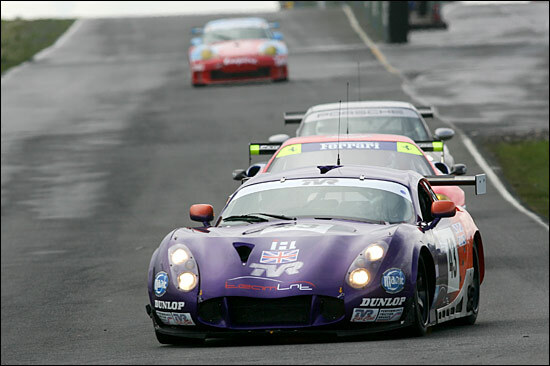 The chase to catch the leading trio meanwhile was helped enormously by a mistake by Tim Mullen, the #34 Ferrari sliding out of second place at the John Weir Chicane and dropping back to 8th. Hughes had no choice but to lift off the throttle and in no time at all the now up to speed Embassy Porsche was right on the TVR’s tail - and then through into second place. All of these early dramas had played into the hands of Andrew Kirkaldy: the #35 Ferrari held a seven second lead at the end of lap 2, with Collins, Hughes, Caine and Godfrey Jones circulating nose to tail behind. Collins now began to eke out an advantage in the chase for second place, with Caine and Hughes engaged in almost medieval combat behind, the Porsche man looking inside and out of the TVR along the pit straight, but Hughes toughed it out to retain the position for lap after lap. Warren eventually made good his escape as Caine fell back a little, the TVR now beginning to reel in the Embassy Porsche ahead. Further back both Tim Mullen and Jonny Kane were climbing up the order fast, catching the leading GT3 pair very quickly. The lap times meanwhile were tumbling, Kirkaldy, Hughes, Mullen and Kane all into the 51 second bracket as the track dried out completely. The Mullen / Kane train was now reeling in the pair of Eurotech Porsches, with the ability to deal with traffic a key to maintaining the ultimate pace. The task for Scuderia Ecosse suddenly became a little easier as Warren Hughes pitted early, engine cover off from the TVR and long faces all round, the engine looking very hot and bothered, race over for the #43 T400R. 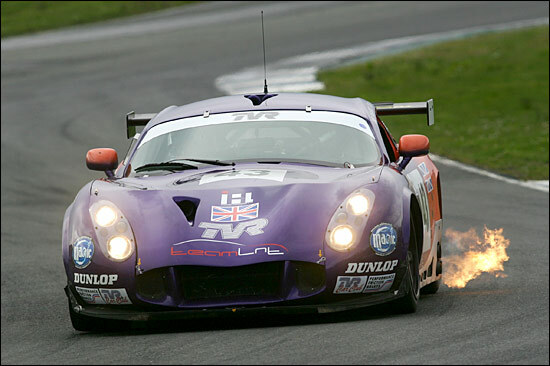 Then, with a pitstop looming for Andrew Thompson to take his turn, the final act in a Shakespearean tragedy of a weekend for Team LNT was played out, Jonny Kane pulling off the circuit on the exit of Hislops, the engine of the #42 TVR apparently suffering another component failure, the ‘batch fault’ theory looking ever more credible. The obvious pace of the T400Rs was little consolation, as the cars were packed away for the long trek home. For the record the race ended as a Scuderia Ecosse 1-2, and one to forget for Team LNT - but the TVRs will be back with a vengeance next weekend at Britain’s fastest circuit, Thruxton for another double header of one hour races.